Home › Economy › What would be the consequences of a Greek default for Finland? Some days ago, the Greek government decided to consult its population with a referendum which will take place next Sunday before accepting or rejecting the proposals of the three institutions (European Commission, European Central Bank and International Monetary Fund). Immediately, the other EU countries decided to consider that this democratic move was meaning that Greece was rejecting the proposals and decided to stop the negotiations, which is a little surprising as the result of the Greek referendum may lead to an agreement by the Greek population. There has been in the last hours some news from Greece, and Alexis Tsipras has asked for a prolongation of the negotiations after the result of the referendum. In a letter which seems to have been addressed to all EU governments, Alexis Tsipras is writing: “In order to carry out the referendum in a calm and positive climate that allows the Greek people to make this crucial decision without external pressure, the Hellenic Republic submitted on the 27th June, during the Eurogroup session, a request for an extension of the Master Financial Assistance Facility (MAFA) for a period of one month from the date of its termination. Negotiations will recommence on Monday July 6 2015, with a view to reaching an agreement immediately afterwards in line with the decision of the Greek people“. There is no reaction to this proposal, which has been seen as unacceptable for the eurozone Member States, in particular Germany and Finland. What will happen In one week? There seems to be a 50% chance that the Greek people follow the government and refused the hard deal proposed by the European Commission, European Central Bank and International Monetary Fund, with the support of the European Council, and 50 % of chances that they accept the proposed deal. I suppose, reading the comments in the newspapers and in the parties supporting the government, that this Greek decision will be followed by what is called a Grexit, meaning that Greece will leave the eurozone, as a lot of people consider that it would be OK, as Greece has not been able to reimburse its loans, that they are excluded from the eurozone. So nobody, except perhaps some Southern countries, will push for a better arrangement which could be easier accepted by Greece, such as for example the last proposals from Greece which were acceptable for the EU Commission and some countries such as France. All the countries in the eurozone are readying themselves for a Grexit. There has been crisis meetings in the last hours in London, Paris, Berlin, Roma and Madrid, and one can hope that the same goes for Helsinki. Generally, these meetings conclude publicly that there is no reason to panic, that everything is under control and that there is no risk or consequence for the EU countries. However, Angela Merkel has summoned leaders from all German political parties to talks in Berlin today after Greece closed its banks for a week-long holiday — the seven days remaining to save the European project. And the markets are beginning to panic, with the main EU financial market have been going seriously down today, by around 4 % in France and Germany, and 2,2 % in the UK (London). It looks like in Finland there is not such panic, as Greece is far away, and Finland’s exposure to a possible Greek default would be limited. Really? I particularly love the tone of the American financial press about who is going to suffer. CNN Money is for example writing: “Breathe! Grexit will probably not push your bank to its knees […] Foreign banks loaned just over $46 billion to Greek banks at the end of 2014. That compares to $300 billion in 2010, according to data from the Bank for International Settlements. No single bank holds a significant chunk of this debt, so no one creditor would take too much of a hit if Greek banks collapsed. German, American, and British banks are the most exposed — German lenders hold around $13.2 billion, and banks in U.S. and U.K. around $12 billion. If Greece defaults on its sovereign debt, taxpayers from other eurozone countries would take the hit“. So far so good: Finland’s bank system is not going to collapse. But the Finnish taxpayer will have to face the costs, but how much will it be? There has been a number of calculations, and they arrive to approximately the same results, with the most credible and detailed analysis being made by the IESEG School of Management in Lille. They concluded in their last calculation that the Finnish taxpayers will inherit a global debt of 4.873 billion euros (or borrow and reimburse them). It is more than the budget cuts for the 2 first years of Juha Sipilä’s government programme, and it represents around 2,5 % of Finland’s GNP. It is well-known that the countries in default are generally reimbursing part of their debts, and I suppose that Greece will do it also. But remember: Argentina defaulted in 2003, and agreed in 2005 with its debtor to reimburse between 25 and 35 % of the initial debt. Germany after the last war got an agreement to pay only approximately 50 % of its debt. You can bet that Greece situation will be bad if it goes out of the eurozone, and Finland may lose some billion euros. This is not the worse. If you have followed today’s news, you have seen that today Portugal and Italy begin to suffer from highest interest rates, when France and Germany see their interest rates going down again. It is directly linked to the fact that the markets are anticipating that some countries will have the same difficulties as Athens, when their debt will increase in case of Greece’s default: Spain will have to find 33 billion euros, Italy 48 billion… when their debts are already largely over the limits (and in the case of Italy and Portugal over 130 % of their GNP, where Greece was some years ago). If these countries are in difficulty, it means that they will be in the same situation as Greece some years ago, which seems to be the case for Italy and Portugal, the crisis coming from a Greek default can bring a financial cataclysm in the EU, and all countries will suffer. 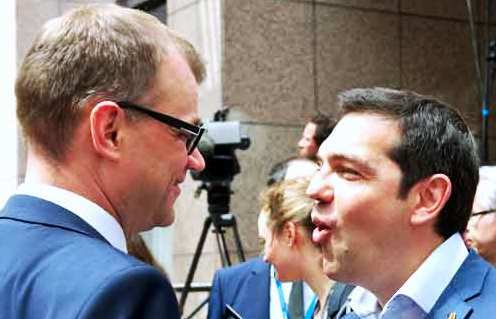 ‹ Will Finland continue to oppose last-minute compromise with Greece on Monday, when Russia announced it could help Greece? The funny thing about the Greek debt, as well as Finland and other european nations’ “responsibility” shoulf Greece exit, is that it all was created / leveraged out of thin air. And there’s no reason to believe the debt couldn’t be expunged in the same manner. Bankers are the same as the Wizard of Oz behind the curtain. Watch “The Secret of Oz” documentary by Bill Still, and understand a Greek return to the drachma is the best choice for the people there.